On June 11, 1848 Andreas Schoenly, son of the immigrant Friederich died. His wife Anna Maria Schweinhardt had passed away about three years prior to his death. Two of his sons, Frederick & George became his executers. 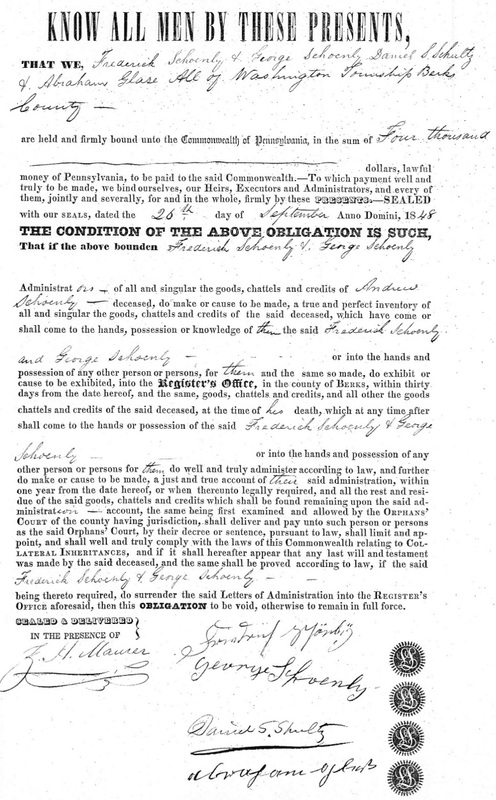 The attached document, dated September 20, 1848 outlines their responsibilities. Of interest on the document are the signatures of both Frederick & George. Also note the the spelling of the name, Schoenly, is the same as is most often currently used. Personally, I did not believe that this variation of the family name was in use until much later.